The minister was speaking at the 13th Session of the General Conference of ISESCO in Rabat, Morocco, and shed light on the initiative of His Highness the Amir Sheikh Tamim bin Hamad al-Thani to provide education for a million girls around the world by 2021. The announcement was made during a round table meeting held on the sidelines of the UN General Assembly in New York last month. Al-Hammadi also highlighted the efforts of Education Above All in providing education to 10mn children around the world, through Educate A Child programme. He also discussed efforts in supporting the Palestinian cause and said that Qatar’s commitment to the issue and to Al Quds was not limited to condemnations, but extended to material and moral support in all fields for Palestinians in the occupied territories and in Al Quds. The aid provided by Qatar to the Palestinians from 2010-2017 was QR3.872bn, in addition to non-governmental support from 2010-2016 that reached QR2.345bn. The minister said that those large sums were directed towards humanitarian, developmental, healthcare, social services, wages, as well as the financing of public agencies. Qatar also provided $50mn to the UNRWA in 2018 to support the education sector, in addition to covering the payments of a number of Palestinian students in Lebanese universities. 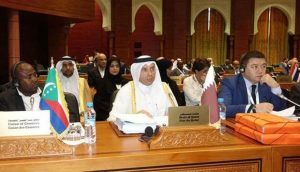 On Al Quds, the minister highlighted the decision of HE the Deputy Prime Minister and Minister of Foreign Affairs Sheikh Mohamed bin Abdulrahman al-Thani regarding the reformation of the Permanent Qatari Committee for the Support of Al Quds, and the pledge to provide $250mn for Al Quds projects. Al-Hammadi noted that Qatar and its wise leadership has paid great attention to education in terms of curriculum development, the use of new technologies, and raising students’ morale, which resulted in good results and positive steps towards achieving Sustainable Development Plan Goals 2030 and Qatar National Vision 2030. He highlighted that Qatar enjoys good international rankings in terms of the quality of education in all its different aspects, according to the World Economic Forum’s Global Competitiveness Report. Al-Hammadi said that this year’s conference is held at a time of grave regional and international developments, pointing out to the increasing challenges facing the stability and security of member countries and added that there was also growing extremism and sectarianism, in addition to the violations of international conventions and growing hatred between nations.